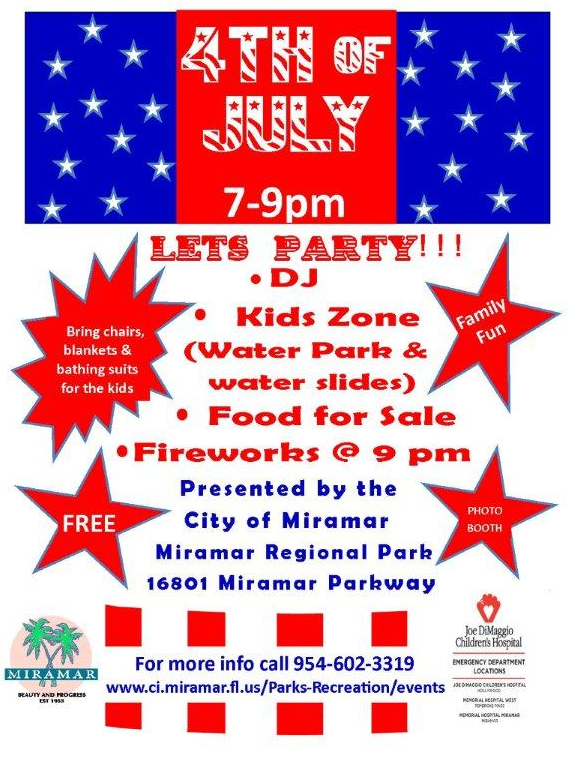 I was sent this flyer regarding the City of Miramar's 4th of July celebration this year at Miramar Regional Park. I also found it here online. Here is some other information I found on the city's website mentioned in the flyer. There will be free inflatable rides for children of all ages. The Miramar Regional Park Aquatic Water Park will be open for all children. Must be 50” tall to go on the water slide. Please remember to bring bathing suits, towels and a change of clothes. AND DON’T FORGET YOUR CAMERAS. Bring your blankets and chairs for your comfort. Shuttle bus service will continue until all passengers have been returned to their original pick up point.